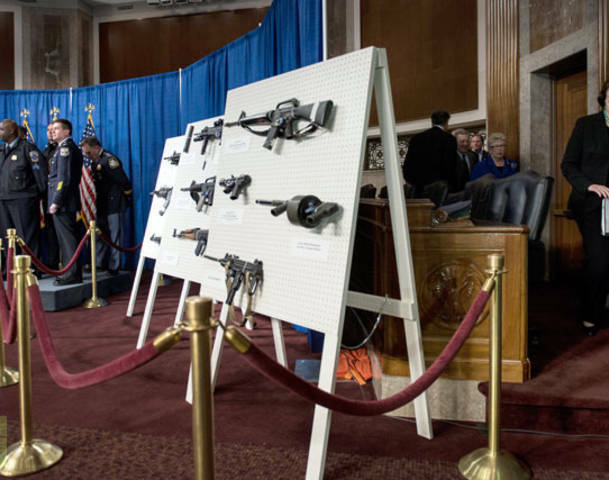 On Thursday, Feinstein proposed that people who already own such weapons would be required to secure them and use safety devices, while banning them from reselling any associated high-capacity clips. According to The Hill, Feinstein and her group introduced the bill at a press conference with law-enforcement groups that support the legislation. Groups endorsing the bill include the US Conference of Mayors, the Major Cities Chiefs Association, the Police Foundation and the International Association of Campus Law Enforcement Administrators. Feinstein, who also sponsored the 1994 ban, acknowledged the bill would face stiff opposition in Congress, since the white-hot issue has been the subject of heated discussions since Sandy Hook prompted the president to take action. Vice President Joe Biden spent a week meeting with industry leaders, including the National Rifle Association, video-game makers and leaders in the movie industry before offering a list of proposals to President Obama. The ban includes a grandfather clause to exempt current lawfully owned assault weapons. But any sale of such weapons would require a background check. The NRA was quick to respond and bash the effort, issuing a statement indicating they will lobby to block passage of the ban. The NRA has been radically instrumental in ginning up protest against what they characterize as an assault on the Second Amendment. Nonetheless, Obama made it clear that his aim was not to take guns away from lawful owners, sportsmen or hunters and he reaffirmed his support of the Second Amendment in his address to the country after Sandy Hook. The law is designed to evade loopholes that were present in the 1994 ban, but Feinstein emphasized that her bill will not impact hunting and sports rifles.